Laura Erdman-Luntz, MA, E-RYT(500) | Yoga | Yoga Teacher Training | Minnesota | Costa Rica | Life Coaching : A Coaching Moment: How do You View Failure? Warning: About to get on my soap box around the concept of "failure" again. I have experienced a few traditionally translated "failures" over the past few months so I have been considering this topic quite deeply lately. I was recently watching Bob Mankoff's Ted.com talk, Anatomy of a New Yorker Cartoon. (Aside: It is very funny. Worth the click and watch!) Bob is the New Yorker magazine's esteemed cartoon editor and has been since 1980. Between the years 1974 and 1977, he submitted 2,000 cartoons to the New Yorker and was rejected every time. Every time. Not one in three or even one in 12, but 2,000 times. Think about that a moment. Seriously. How many times would you submit before you threw in the towel? Honestly, I am thinking 10 tops. This guy stuck to it and three years later he became the editor and has been the editor now for over 30 years. Awesome! Thomas Edison (and his staff, I will add) supposedly took two years and used up over 6,000 filaments in experimenting with perfecting the lightbulb. A reporter came asked Edison, "How many times are you going to fail at creating the light bulb?" Mr. Edison replied, "Son, I haven't failed! I've simply discovered another way not to invent the light bulb!" Again, I ask you, how many times would you have attempted it before giving up? 100 seems like alot, but 6,000? Jack Canfield and Victor Hansen, creators of the Chicken Soup for the Soul series, were turned down by 162 publishers even with an affidavit signed by 20,000 people who promised to buy the book once it was published! When the book was finally published, it went on to become the best selling series of all time AND the first book to sell a million copies in one day. Is this failure? In the 2000 presidential elections, George W. Bush was elected as president despite receiving fewer popular votes than Al Gore, the runner-up. He didn't even have the majority of the American citizens behind him, but he was still our president. He had to get up every day and do his work, knowing that not even the majority wanted him to be doing what he was doing. Really, all presidents have at some point during their presidency, found their opinion poles not thrilled with them. They face criticism and very strong opinions. Yet, they keep going. They keep doing what they need to do. You know what I see in all of these examples? People who believe so deeply in themselves and what they are doing that they only see their "failure" as learning what doesn't work. If you think you have failed, you do not believe in yourself enough. Our job is to build our personal strength to be so strong, nothing will shake it. It doesn't matter what others say or think, we know what we are doing is the right thing for us. Is there a situation from your past that felt like a failure? Is there something going on in your life right now that is hard? Do you feel like you are failing? What can you do to redress them? Can they be lessons learned? A way to strengthen your resolve? "Our greatest weakness lies in giving up. The most certain way to succeed is to try just one more time." 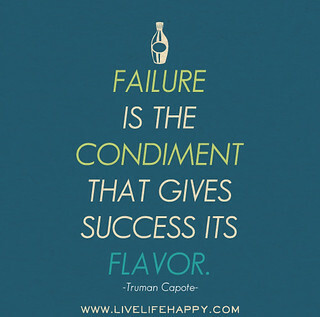 Let's Lose the Word "Failure"